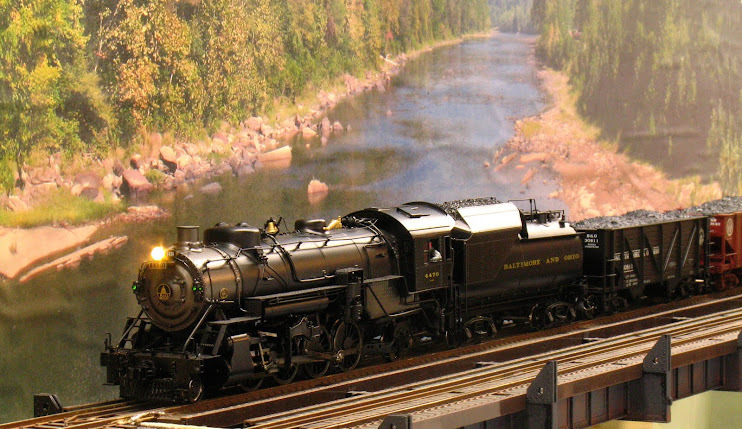 It's Monday night Sept. 5, Labor Day, and my layout tour is just 5 days away. I'm about a day behind schedule in what I planned to have ready and it looks like the temporary loop to connect the Cheat River grade with hidden staging is not going to get built. I have a busy week at work this week and I will not get back to the layout until Friday, at which time I will be cleaning up and making last minute electrical connections. New benchwork and trackwork has been added adjacent to the section completed last week. There are going to be two tracks on the section to the right, but only the one track shown will be ready in time for the 10th. The future site of the Tray Run Viaduct now has track laid on it. I'm really happy with the track alignment going onto the Tray Run Viaduct, this next photo of the track on the viaduct does not show the shallow 'cosmetic' curve leading into the bridge. 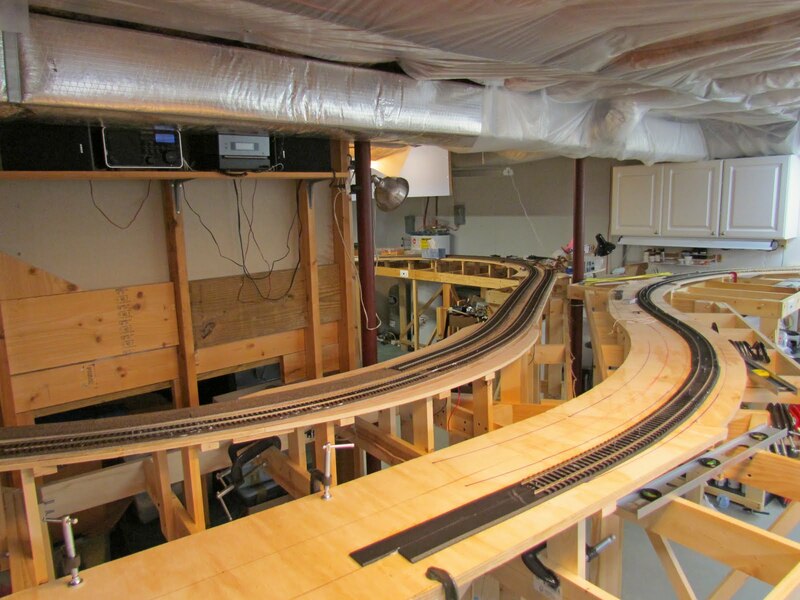 I have not run any rolling stock through this track yet, it will get a trial by fire, probably Friday night. The top of Cheat River grade is shown in the next photo. 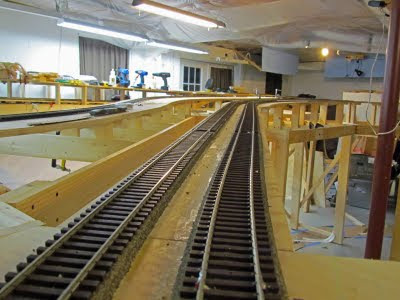 Since the temporary connection between here and staging will not happen prior to the open house, I will not finish this track to the very top of the grade before Saturday. 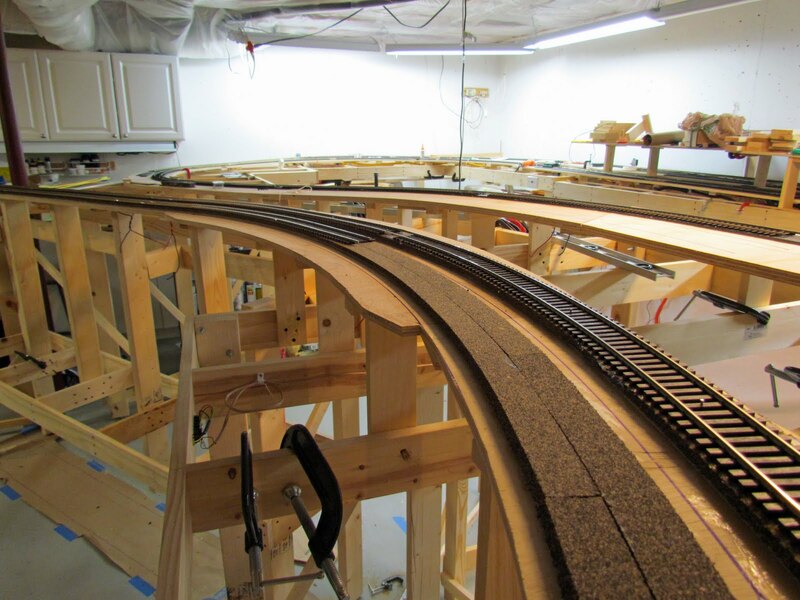 I may add one more section of flex track to the upgrade (westbound) track on the left and call it quits for now. The section of benchwork/track on the right in this next photo leads to hidden lower staging. The track in the picture will be the exit track from staging and another track will eventually be laid to the left of the one in the photo that will be the entrance track to staging. I developed this track arrangement 'on the fly' as hidden staging was not in my original track plan. The graceful reverse curve that resulted is too nice to cover up; but it will be covered eventually. 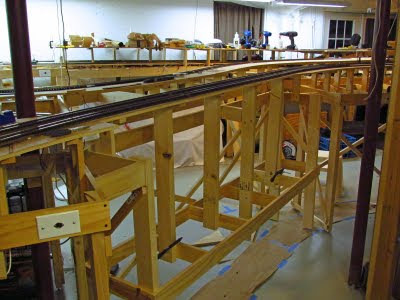 I also have not yet tested this reverse curve with rolling stock, especially passenger equipment, but I anticipate no problems. Because there will be no temporary connection, for the open house the layout will operate as two separate sections. From the top of the Cheat River grade around the basement to about half way up Cranberry grade; this point is above the stub-end tracks of staging. 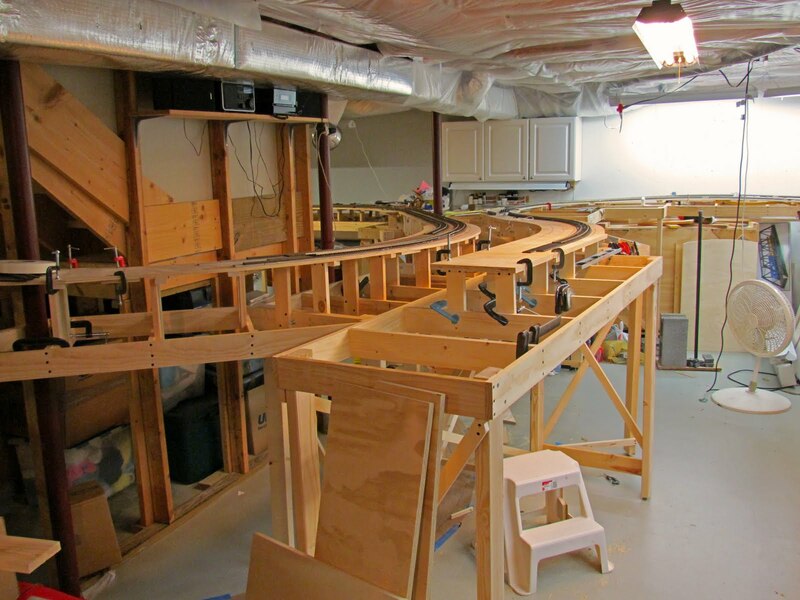 The other section will be hidden staging and one of its approach tracks. I've spent six full days over two weekends working downstairs and made tremendous progress but, because I have not done my usual routine of "planning" a project to death before building and then double and triple checking everything during construction, I'm not sure yet how all of this new construction will come out. If everything comes out OK then maybe I'll learn that I can work faster.